This looks promising: A Kickstarter campaign launched for a project called SPECULATIVE RELATIONSHIPS: A Sci-fi Romance Comics Anthology. I had recently done a search on “scifiromance” on Twitter and the project’s handle popped up (SciFiRomanceCom). As far as I could determine, the romance side of the stories could end on a variety of notes--upbeat, tragic, or somewhere in-between. So it might help to approach this anthology as romantic SF rather than from a romance genre convention angle. I’m looking forward to checking out the stories and the art looks very cool. If this venture inspired a greater expansion of SFR into the comics medium, that'd be nothing short of super! Chicago, IL (May 8, 2014) - In the mid-twentieth century, romance was the most popular genre in comics. Comic publishers produced dozens of titles throughout the 1950s and 60s, and many of the medium’s top artistic talents such as Jack Kirby, Joe Simon, and Frank Frazetta worked in romance comics. However, by the 1970s, the once-dominant genre of romance comics all but died out. The artists featured in the new Speculative Relationships anthology are ready to start the revival. 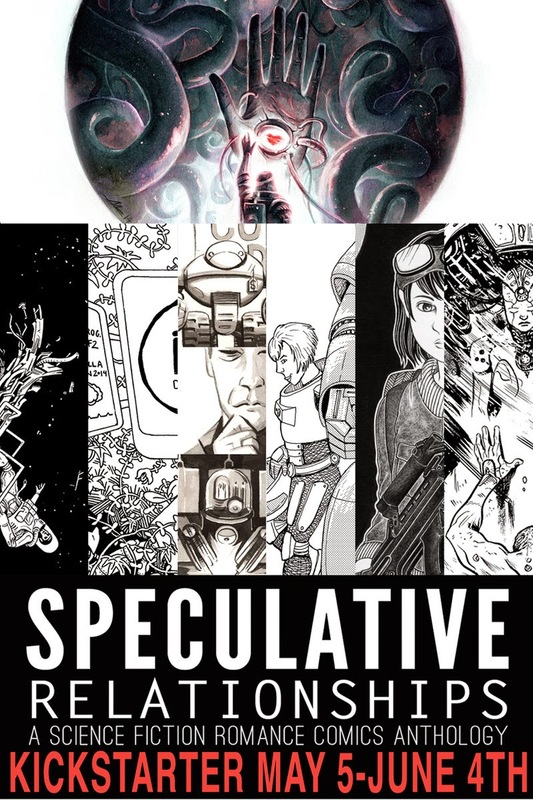 Speculative Relationships editors Tyrell Cannon and Scott Kroll are both fans and creators of science fiction comics, but wanted to try something different. They decided to infuse romance with a science fiction, and the new idea quickly attracted a group of talented comic artists. The eight stories in the anthology include a cyborg fighting alien hordes for love, a computer AI in love with a sleeping interstellar voyager, two robots that were literally made for each other, and so much more! The team behind Speculative Relationships is reaching out to fans directly through an exciting new Kickstarter campaign. The campaign is now live and will run until June 4th, 2014. I know, right?!!!!! Glad to hear that stories mixing SF and romance have a sizeable following!